David Bowie is an English musician, actor, record producer and arranger. Active in five decades of popular music and frequently reinventing his music and image, Bowie is widely regarded as an innovator, particularly for his work in the 1970s. David Bowie first caught the eye and ear of the public in the autumn of 1969, when the song "Space Oddity" reached the top five of the UK Singles Chart. After a three-year period of experimentation he re-emerged in 1972 during the glam rock era as the flamboyant, androgynous alter ego Ziggy Stardust. 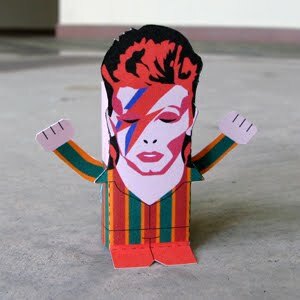 Download the PDF file here and make your own Ziggy Stardust toy! This is fabulous! I'll be linking to Ziggy. thanks rachel for linking ziggy to oneprettything!